I must confess, I have not been on the Internet properly in days, so I apologise for not keeping up with all of your blog posts or keeping up with my own for that matter! I’m sure I will be spending an evening on Google Reader getting up to date with all the delicious recipes and funny posts I have missed over the last couple of days very soon. I have however, had an excuse. Tomorrow (9th Jan) is my Mum’s 50th birthday! So, we have been celebrating! Yesterday, my Dad, sister and I arranged to take her to The Ruben Hotel in London (next to Buckingham Palace over looking the Mews) for a spot of afternoon tea! 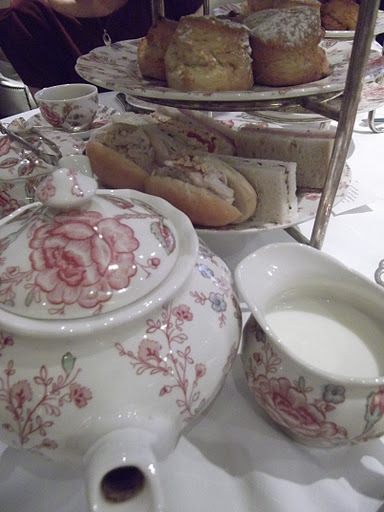 When we did our research, we discovered almost every single hotel in London does its own afternoon tea. If you want to go somewhere like The Ritz or The Savoy, you will have to book at least up to a month or so in advance. After spending a very long evening staring at our laptop screens and on the phone to each other (I was in Nottingham at the time), my Dad and I finally settled on The Ruben. From our point of view they had the biggest range of cakes and sandwiches by far, the pictures showed a beautiful tea room and they also had a pianist to provide light entertainment. Exactly what we were looking for! Now, for anyone who knows my mum she doesn’t do two things; the first is fuss, and the second is surprises! So, taking her to London for the day, having NO idea where she was going or what she was doing (simply being told to ‘dress nice’) was starting to freak her out. She kept guessing in the days running up to it and at one point jokingly guessed “Afternoon tea with the Queen!” When we took her to Buckingham Palace first thing in the morning, she was starting to get a bit worried! 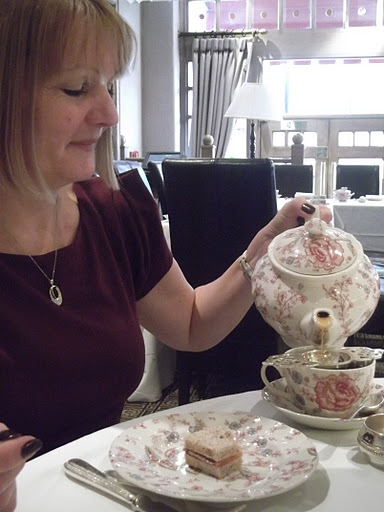 Once we took her to a Hotel just next door she was in fits of giggles – after all, you can’t get much closer to having Afternoon Tea with the Queen when you are paupers like us! Anyway, all of us here are foodies, so I am guessing what you’re most interested in is what we had to eat and drink?! First we had a choice of a selection of teas. There must have been about 30 to choose from! Dad and I shared an Oriental Jasmine Pearl tea which was beautifully refreshing. Mum chose Assam and my sister chose a Darjeeling. She chose it as it is the Champagne of teas and not being a tea drinker, she was disappointed when it didn’t actually taste like champagne! The staff were brilliant, and explained every option to us with an astounding array of knowledge! When they found out it was Mum’s birthday they also brought out free champagne on the house which was lovely of them! Next two large Afternoon Tea stands came out, with sandwiches on the bottom, scones in the middle and cakes on top. Our choice of sandwiches were as follows: Smoked Salmon, Ham and Mustard, Cheese and Tomato, Egg and Rocket, and Chicken Mayonnaise and Almond. There was enough for one of these each, or so we thought. The sandwiches were not small, and although we had not had lunch or breakfast, we were soon finding ourselves full up with two more tiers to go! Nonetheless, our attentive waiter soon came round offering more! He seemed shocked when we said no! For such traditional sandwich choices, I was extremely surprised at how each of them had such exciting flavour. I imagine it was just the sheer quality of ingredients and attention to detail that meant the balance was perfect in each one. The next tier were our scones, there was one raisin and one plain scone each. Now, these must have been the lightest and fluffiest scones I have ever tasted! They melted in the mouth, but still had that crisp outer you expect from a scone, and they broke almost perfectly in two. With the scones came clotted cream, raspberry jam and a chocolate praline spread. This too was replenished when we had greedily topped the first scone and discovered we needed more! The whole time our tea was also being refilled! They would take the tea pot away and bring a whole fresh pot back! Dad and I got through two pots as did my Mum! This really was the perfect present for a tea and cake fanatic! The final tier were the cakes. On each stand there was one of each of the following: a chocolate macaroon, a meringue filled with chocolate, carrot cake with pistachios topped with cream, a coffee and chocolate eclair, shortbread, cherry cheese cake, a chocolate and hazelnut brownie, a beautiful cupcake, and a tart filled with patisserie cream and topped with fruit. Just a small selection of the cakes! I chose the macaroon, the tart, and the cheesecake. I really could not eat any more, and neither could my family. They were kind enough, however, to box up the remaining cakes so I am looking forward to nibbling those later today. All in all it was a beautiful afternoon. We were sat there eating, drinking and being merry for over two hours. The staff were wonderful and the settings were beautiful, we couldn’t have asked for much more, they made my Mum’s days extremely special! If you’re a fan of food and a good cup of tea, I highly recommend The Ruben! We have now decided that as my Mum’s birthday and mine are so close together (exactly a week apart) from now on we are going to do something similar each year! I cannot wait! I know this hotel very well this is luxury boutique hotel in London and i like the services of boutique hotels too much because of award winning management. Sounds like you had a wonderful time. I love their choice of China, so pretty I always find it a disappointed when a hotel serves their special afternoon tea on there normal hotel china. 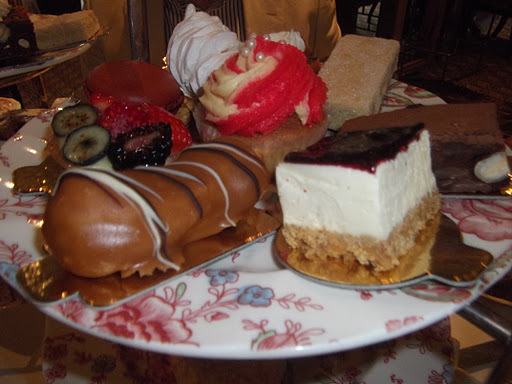 I had afternoon tea at the Sheraton Park Lane in December and was quite disappointed with it, one I would not recommend, although the harpist sounded wonderful. 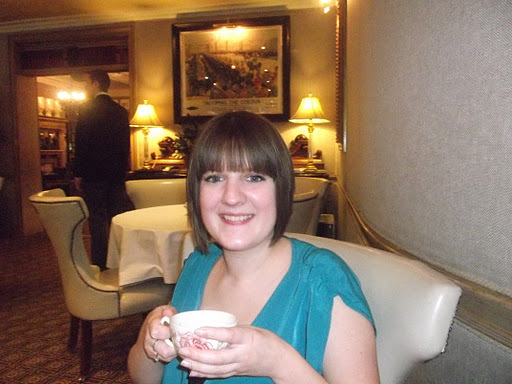 I love doing afternoon tea with my boyfriend, and I'm going to add this place to my list! I went to the Egerton House Hotel once and that was lovely too, but I think I prefer the selection of cakes you have described here, I want to try the pistachio carrot cake… yum… 🙂 p.s. yep, my dad was going on about that Tiger Mother TV programme! I'm think I'm finally appreciating my parents pushing me – 5 years later!